Mykele Deville is a rapper, poet, actor, teaching artist, and author from the west side of Chicago. His solo hip-hop and poetic recordings include Peace, Fam (2017), Each One Teach One (2016), and Super Predator (2016). He has performed on stages across Chicago and led workshops on hip-hop and identity. His work has been profiled in the Chicago Tribune, The Reader, Consequence of Sound, Vocalo radio, and NPR radio. He received a BFA in Performance From the University of Illinois at Chicago and is a Mentor and company member for The Yard Theater Company, working with youth. He is also a founding collective member of Growing Concerns Poetry Collective. They released their inaugural album WE HERE: Thank You For Noticing (2017) and a joint book of poetry entitled Five Fifths, published by Candor Arts. Mykele's acting work is represented by Paonessa Talent Agency. Peace - Freedom from civil disturbance or violence. Freedom from or the cessation of war or violence. Used as a greeting. A state of quiet tranquility. An ode album to Mykele's 9 year old niece, Vaniya. A powerful and smart black girl growing up on the West Side of Chicago. Love the 9 year old in you. 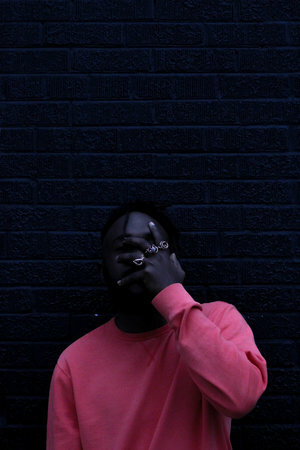 The first album from Mykele speaks on misconceptions of black life, insomnia, loss, paranoia, injustice, and gnawing anxiety. Revolt now and forever. Growing Concerns // Poetry Collective fuses lyrical narrative and hip-hop poetry with original music and soundscape tocreate spoken word performance that is greater than the sum of its parts.